King Tree controls totally the production process of the Kingbrown® . The extract comes from wood harvested exclusively by forest cooperatives in the TARN area (Labruguière). He is now certified organic. The extraction of Kingbrown® is done at high temperature and under pressure with water as only solvent. No other ingredient or material is used during the production. King Tree respects the environment in all its aspects, and that can be seen in every day actions. 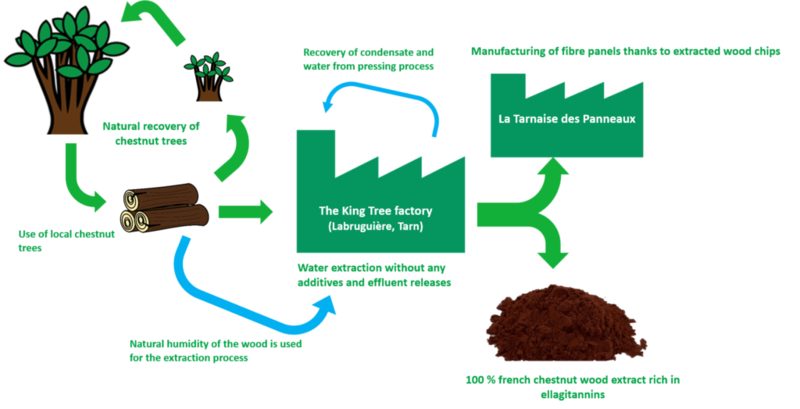 King Tree offers a durable exploitation of the Chestnut tree forests, taking care of leaving dead leaves and small branches on the soil offering a vital carpet for the trees. Chestnut trees, like all others are in fact living organisms that deserve all respect. As well as the sustainable exploitation of the wood, King Tree is committed to produce no waste, respecting the « Cradle to Cradle » principle, which leads to the following status : zero pollution and 100% re-use. In this context the extracted wood chips are recuperated for fibre panels by the « Tarnaise des panneaux », to be used for ecological packaging. Kingbrown® can be offered in bulk or IBC containers in liquid form after evaporation under the denomination of Kingbrown®-L.
Alternatively after atomising, the brown powder can be delivered by bulk truck, big bags, or 25 kg bags (on pallets of 1250 kg).